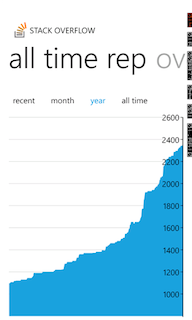 Stack Mate is a simple Windows Phone app which pulls in your StackExchange account details and keeps you up to date with any activity on the site. This application was not created to browse questions, answers, users, etc but rather to give you a central hub for your accounts. Tap on a message or reputation change to jump straight to the related question/answer/comment. It's free! No ads. Just for fun. 1.4 (April 2014) - the app will no longer notify you that you have new messages/notifications more than once per message/notification. This behaviour was previously intended due to Windows Phone 7 missing any kind of central notification store, so it would be easy to miss a notification and you would never know it had occurred. Now with the action centre in Windows Phone 8, this is no required. 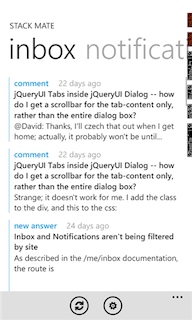 1.3 (March 2014) - previously for inbox messages and notifications to be marked as unread you had to log into StackExchange and select each item to mark it as read. This meant the app could be alerting you about inbox messages and notifications multiple times until you've read them on StackExchange, even though you've already read them in the app. 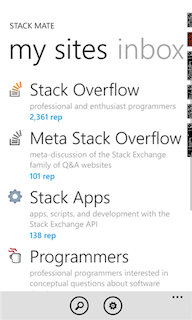 Now you will only be alerted if they are unread on StackExchange and occurred after you last looked at the inbox message or notification screen within Stack Mate. 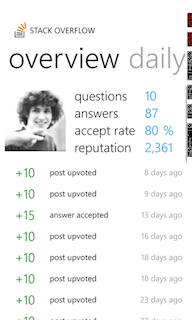 Browse other questions tagged app windows-phone-7 windows-phone .